Brian Segars' whimsical bookends give your ever-expanding library good vibes. 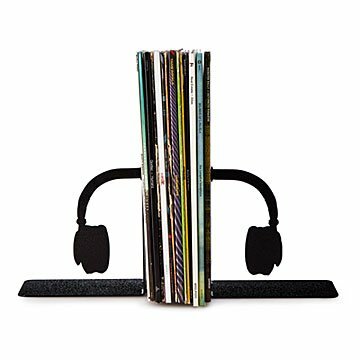 Whether you're keeping the vinyl collection together or need a place for the 20-volume set on the history of Bluegrass, Brian Segars' whimsical bookends give your library good vibes. Hand-cut from carbon steel, they capture the silhouette of a pair of headphones. Give the set to a friend who likes Hendrix and Hemingway. Handmade in Kentucky. When Brian Segars was a kid, his sketches of choice were cars and boats. As a grownup with a degree in architectural design, it became buildings, stadiums, and even railroads. Looking for a change of pace from his engineering design work, Brian started experimenting with metal. Now, he uses his building background, along with some creativity, to design unique, modern pieces for the world to enjoy.